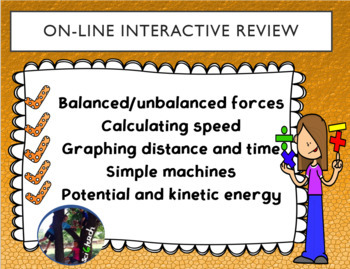 Great review that provides links for student on-line review and then provides a worksheet that goes along with each section. I use this before a couple days before we take our 6th grade physics unit exam. It is a great way to see which students need to still be pulled out for intervention. Easy grading for the teacher. This is aligned to the 6th grade TEKS, 6.8ABCDE, but works well for 8th grade quick review before the STAAR test too. The product contains a power point, student sheet, and answer key. I would be grateful if you would follow my store! I will let you know every time I post a freebie, a new product, or have a sale. To follow me, just click “Follow Me”. Please keep in mind that it is beneficial for you to review purchases as you will receive credits which will help you save money. If you have a problem or see an issue, please contact me prior to leaving a negative feedback as I will do everything possible to make it right. My lessons have been tested by those important young folks. I appreciate your business and you stopping by my science place. Have a wonderful day! By purchasing this product, the purchaser receives a limited individual license to reproduce the product for individual single classroom use only. This license is not intended for use by organizations or multiple users, including but not limited to school districts, schools, or multiple teachers within a grade level. This resource is not to be shared with colleagues, used by an entire grade level, school, or district without purchasing the proper number of licenses. No part of this publication may be reproduced, distributed, or transmitted without the written permission of the author. This includes posting this product on the internet, in any form, including classroom/personal websites or network drives. I am an individual TpT seller with no affiliation with TEA or ETS, the makers of the STAAR assessments. This product is designed to help students to be successful on the STAAR assessment and is aligned very carefully with the new Texas state standards, or TEKS. Check out my other newly revised TEKS aligned products for 6th, 7th & 8th grade.